In last week’s post, Juan noted that the Encyclopedia Britannica first recorded the philosophical meaning of the term “rationalism” in the early twentieth century. As Juan states, this lends support to the view that “rationalism” started to be “used to refer to early modern philosophy” in “the first decades of the twentieth century”. I am sympathetic to this view. In this post, I will defend it from two objections. This objection can be dispensed with rather quickly, as Peter did on this blog some time ago. Bacon did not use the term “rationalists”. He referred to those who “spin threads out of themselves” as “rationals” (rationales) and to their philosophy as philosophia rationalis (rational philosophy, e.g. in Novum Organum, I, 42, 64), not as rationalism. One cannot find a philosophical use of the English terms “rationalist” or “rationalism” in Bacon’s texts. RATIONALIST, n. One who proceeds in his certain disquisitions and practice wholly upon reason. – Bacon. (I owe these references to Li Ling.) Webster’s entry recalls a passage by Shaftesbury, to whom, according to the Oxford English Dictionary, we owe the first recorded use of the term “empiricist” (1705). Shaftersbury characterizes rationalists as those “who walk by Reason in every thing”. 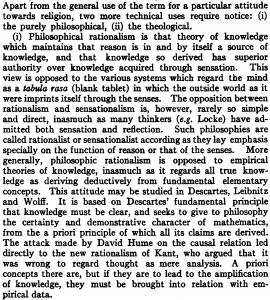 This statement may sound rather similar to one that can be found in an early twentieth-century edition of the Encyclopaedia Britannica: according to rationalists, «reason is in and by itself a source of knowledge» which «has superior authority over knowledge acquired through sensation». How can we respond to this objection? It is true that there are early modern uses of the term “rationalist” in relation to philosophers. However, the term was used for philosophers in the broad early modern sense of all those who pursue scientia, especially for natural philosophers, and has a methodological connotation: it designates their (reflected or unreflected) reliance on reason. By contrast, the twentieth-century philosophical use of “rationalism” designates the endorsement of a specific epistemological view. In the terms of the Encyclopaedia Britannica, “philosophical rationalism” is a “theory of knowledge”. Additionally, the existence of early modern philosophical uses of the adjective “rationalist” does not entail that the noun “rationalism” was used in a philosophical sense too. The term was mostly used in a theological sense to designate those who stressed the importance of reason not over the sense, but over faith or revelation. Whereas Webster’s dictionary records a philosophical use of “rationalist” with a reference to Bacon, it does not record any philosophical use of “rationalism”. 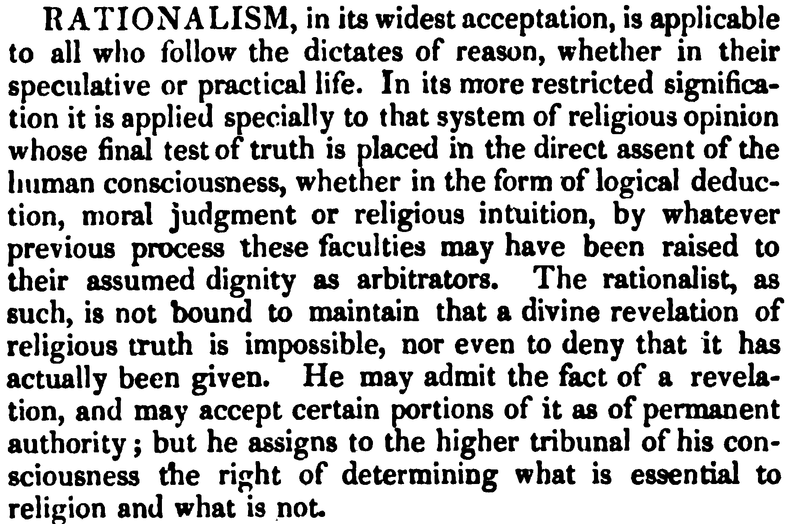 For Webster, rationalism is “[t]he practice or tenets of certain latitudinarian divines”. Shaftesbury contrasts the attitude of the rationalists, who “exalted Reason above Faith“, with the prominence that he accords to faith above reason: “We for our parts know nothing, and believe all”. 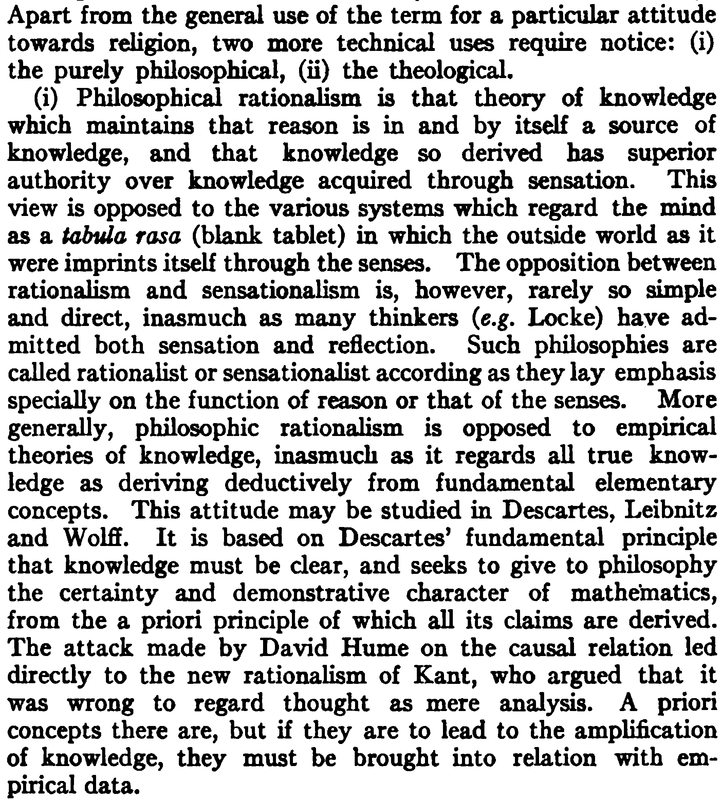 Finally, pre-Kantian writers nearly did not associate the term “rationalism” with the textbook rationalists of twentieth-century texts, namely Descartes, Spinoza and Leibniz. Indeed, the only pre-Kantian text of which I am aware which groups together Descartes, Spinoza and Leibniz is Account of Sir Newton’s Discoveries, but it does not use the term “rationalism”. One can find the association of “rationalism” with Descartes, Spinoza and Leibniz in nineteenth-century translations of German texts, but the English term “rationalism” started to be routinely associated with Descartes, Spinoza and Leibniz only around the turn of the twentieth century. It is only in this period that, as is witnessed by the changes in the Encyclopaedia Britannica highlighted by Juan, the now-standard epistemological usage of “rationalism” to refer to early modern philosophers became established. In my previous post I explored the use of the terms ‘experimental philosophy’ and ’empiricism’ in the Encyclopædia Britannica. Today I will look at the terms ‘speculative’ and ‘rationalism’ throughout the first nine editions of the Encyclopædia. There is no entry for ‘speculative philosophy’ in any of the eighteenth and nineteenth century editions. However,the term ‘speculative’ on its own appears in the first seven editions (1771-1827). It is a very short entry, it was never expanded or modified and it disappears entirely from the 1853 edition onwards. We can see Bacon’s contrast between speculative and practical present in this definition which remained in the exact same form in all the editions it appeared. It seems to be more of a dictionary definition pertaining to the standard meaning of the word at the time. This is also the case for the term ‘rational’ that appears only in the first edition (1771) of the Encyclopædia. 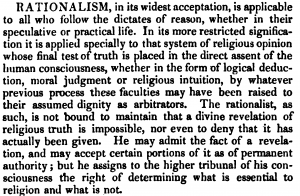 On the other hand, ‘rationalism’ appears for the first time in the same edition where the terms ’empiric’ and ‘experimental philosophy’ disappear, and there is no entry for ’empiricism’ yet (it first appeared in the 11th edition in 1910). We can see here that even by the mid-nineteenth century the term still had a restricted meaning that pertained specifically to religion. It is not until the first decades of the twentieth century that we see the terms ‘rationalism’ and ’empiricism’ being used to refer to early modern philosophy, showing that the ESD framework has some considerable advantages over the RED for interpreting the Early Modern period. The Cartesian vortex theory of planetary motions came under serious suspicion in England in the early 1680s. To be sure, many still spoke of ‘our vortex’ well into the 1680s and ’90s, such as Robert Boyle in his Notion of Nature of 1686 (Works, eds. Hunter and Davis, London, 1999–2000, 10, p. 508), but by the early 1690s the new Newtonian cosmology was coming to be widely accepted and many in England thought that the vortex theory had been disproved. By that time the vortex theory of planetary motions had come to be seen as the archetypal form of speculative natural philosophy. What was required then was a new descriptor for that cosmological structure in which the earth is located. And a new term was soon deployed, namely, ‘solar system’. There is no evidence, however, that Bentley was using the term as an alternative to ‘our vortex’. 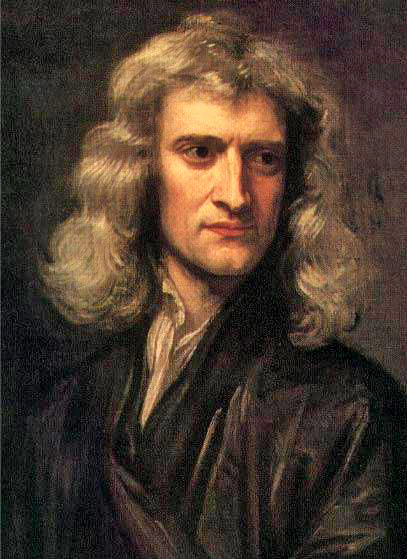 In a letter to Newton of 18 February 1693 he speaks unabashedly of matter that ‘is found in our Suns Vortex’. Who published the word first? Bentley’s seventh Boyle lecture was not published separately, but appeared in the 1693 volume, the last lecture of which was not given its imprimatur until 30 May that year. Locke’s book was advertised in the London Gazette #2886 for 6–10 July. I have not been able to establish exactly when Bentley’s volume appeared, but it’s not mentioned in the London Gazette before #2886. Whatever the case, it is most likely that the term was already ‘in the air’ and history shows that it was soon widely used and, of course, it is a commonplace today. A Serie’s of Quere’s propounded by Mr. Isaac Newton, to be determin’d by Experiments, positively and directly concluding his new Theory of Light and Colours; and here recommended to the Industry of the Lovers of Experimental Philosophy, as they were generously imparted to the Publisher in a Letter of the said Mr. Newtons of July 8. 1672. … and hypotheses, whether metaphysical or physical, or based on occult qualities, or mechanical, have no place in experimental philosophy. In this experimental philosophy, propositions are deduced from the phenomena and are made general by induction. In 1672, would Newton have been comfortable with Oldenburg’s label ‘experimental philosopher’? Or did he consciously avoid the label, as Alan Shapiro suggests, in order to distance himself from the methodology of the early Royal Society? To begin, what did Oldenburg mean by ‘experimental philosophy’? Let’s look at his prefaces to each issue of the Philosophical Transactions. But, when our renowned Lord Bacon had demonstrated the Methods for a perfect Restauration of all parts of Real knowledge … The success became on a sudden stupendious, and Effective philosophy began to sparkle, and even to flow into beams of bright-shining Light, all over the World. bound to study and teach all sorts of Natural, Experimental Philosophy, to consist of the Mathematicks, Mechanicks, Medicine, Anatomy, Chymistry, the History of Animals, Plants …. and briefly all things contained in the Catalogue of Natural Histories annexed to My Lord Bacon’s Organon. … we may not lay aside the other expedient, which is so helpful to explicate the Old Wonders of Art, and Old Histories of Nature; namely, To inquire diligently The things that are; What Rarities of Nature, and what Inventions of Men are now extant in any parts of the World. Would Newton have approved of this way of describing his work? … the Theory … was evinced to me … not by deducing it only from a confutation of contrary suppositions, but by deriving it from Experiments concluding positively and directly. And in the first paper, he wrote: “And I shall not mingle conjectures with certainties”. While Newton didn’t construct natural histories, he may have approved of the Baconian overtones of the label. For, as I’ve discussed previously, Newton’s 1672 queries resemble Baconian queries. Since the Ancients (according to Pappus) considered mechanics to be of the greatest importance in the investigation of nature and science and since the moderns – rejecting substantial forms and occult qualities – have undertaken to reduce the phenomena of nature of mathematical laws, it has seemed best in this treatise to concentrate on mathematics as it relates to natural philosophy. This Analysis consists in making Experiments and Observations, and in drawing general Conclusions from them by Induction, and admitting of no Objections against the Conclusions, but such as are taken from Experiments, or other certain Truths. For Hypotheses are not to be regarded in experimental Philosophy.